In the past week, Donald Trump has done more to endear himself to the regular, everyday, working Americans than almost every politician out there has in the last fifty years. Capping off a week that saw the man clinch the Republican nomination for president of the United States a full ten days before the last of the primaries were scheduled to commence, and he celebrated the victory with a working man’s lunch (McDonald’s burger with fries), the Billionaire from Brooklyn spent Memorial Day weekend with one of the most underappreciated advocacy groups in the country: Rolling Thunder. What makes Rolling Thunder special isn’t so much their commitment to memory of veterans everywhere, but moreso to being sure that We the People do not forget those still listed as missing in action, and who are still held as prisoners of war, whoever and where ever they may be. In 2016, one of the main campaign issues as defined by the populist sentiment driving the “throw the bums out” attitude among the people is the state of the U.S. Armed Forces as they stand, and the dysfunction at the Veterans Affairs Department. Both topics have prompted Trump to not just talk about them, but to actually hold fundraisers (payments to veterans groups were made through the Trump Foundation) to help the people who offered their lives for our freedoms, and to draw even more attention to the systemic failure in the VA behemoth. 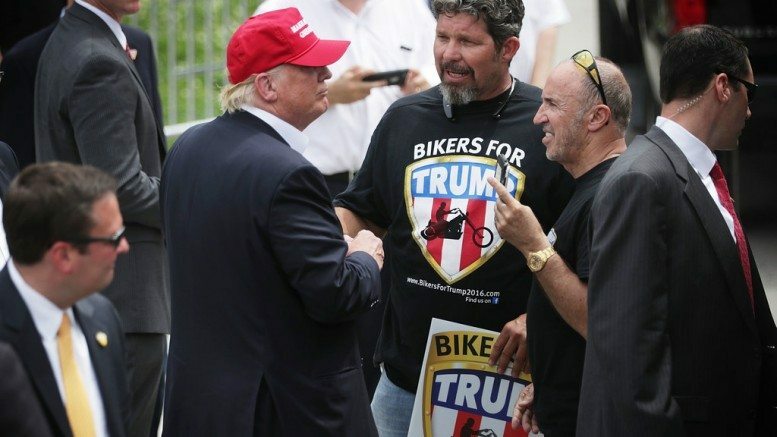 And now, on the weekend we honor our war dead, and those who are still serving this country by offering their lives in exchange for ours, Mr. Trump pad the ultimate honor to Riolling Thunder, by appearing at their event in Washington, D.C.
It’s an amazing thing for a politician to actually acknowledge America’s bikers, let alone thank them for their service both in the past and now as they voluntarily put themselves between paid anarchists and the people’s choice for leader of the country. Most of the time, the elites of the political class don’t even admit such people exist. Not only does Trump admit they exist, but he thanks them with a quick stump speech with no teleprompter that is better than anything Hillary Clinton can utter. If the professional political class can’t see what Trump has that none of their chosen ones do, they need to go back to communications school. The energy, the parallel structure to his speeches, the condensed information…this should all be in no brainer territory.